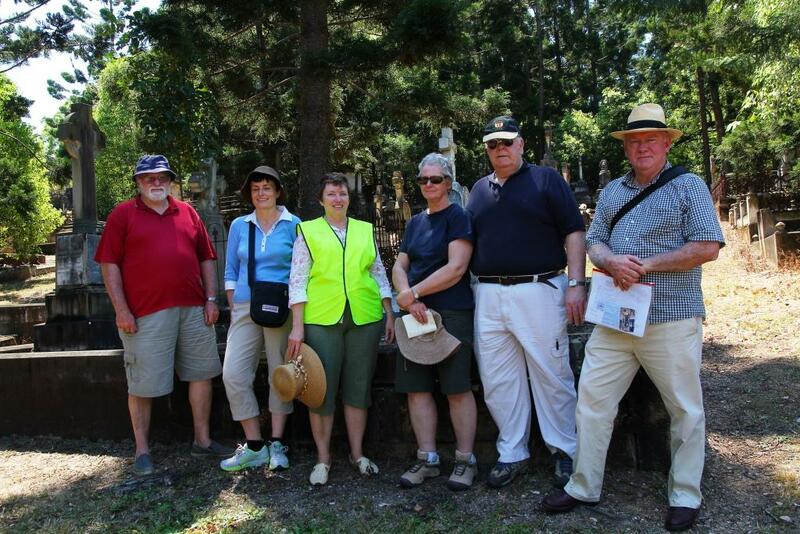 On Sunday, 7 October 2012 a tour of selected police graves at the Toowong Cemetery was conducted by Hilda McLean, the President of the Friends of the Toowong Cemetery. Approximately thirty interested persons attended. These included representatives from the Friends of the Toowong Cemetery Association, Friends of the Queensland Police Museum and the Queensland Police Museum. FQPM President Bob Burns, Committee Member Ian Townsley his wife Christine and member Bryan Silvester, together with the Curator of the QPM, Lisa Jones enjoyed the tour. The tour was of great interest to those who attended and it revealed that some of the graves were either without headstones or were in need of restoration. These graves may be considered as future projects by the FQPM Management Committee. Police grave tour at Toowong Cemetery. L-R: Bryan Silvester, Lisa Jones, Hilda Maclean (Friends of Toowong Cemetery), Christine Townsley, Ian Townsley, Bob Burns.